Last time we spoke about artificial intelligence, we looked at some pioneering digital quality and safety risk assistants, which surface insights into potentially critical project risks which might slip through the cracks, only to resurface as major issues later in the project. In this article, we’ll look at another artificial intelligence application for construction which can assist project schedulers to generate a range of optimal project construction sequences that a human planner might miss. ALICE (ArtificiaL Intelligence Construction & Engineering) is able to generate millions of project schedule scenarios in a matter of minutes, then presents a handful of the most appealing alternatives to the project team for further consideration and validation, to guide them to select the best option. First, a project team produces production recipes. These are sequences of activities needed to produce a building component - for example a wall assembly, concrete slab, steel roof, or piping run, and are input by the project planner/schedulers and the site supervisors. Once codified, these parametric mini-schedules can be applied to all similar objects in the project. They can be easily adjusted and the results of changed parameters are quickly visible. Recipes can even be saved and passed on to other projects for future use and refinement. Next, these recipes are linked to the objects and systems in a BIM model, which contains detailed information about location, quantities and types of materials. On complex projects where clients and contractors require designers to produce detailed models for coordination and asset management, these information rich 3D models are readily available and can easily have recipes applied to them. The team then asks Alice to run the schedule. She first determines which tasks have no predecessors and so can be done first, then analyses thousands of alternatives against spatial constraints, crew sizes, and other factors, repeating this process for each sequence until a schedule is built up. Being an intelligent assistant, Alice understands calendar nuances, for example that concrete cures over the weekend even if crews aren’t working, giving preference to schedules which plan for curing on weekends. Alice crunches the schedule numbers in a tiny fraction of the time that humans could, and presents a range of options for the project team in a simple to use web-interface, allowing human engineers and schedulers to spend more time fine tuning the viable sequencing options and optimizing the constructibility. 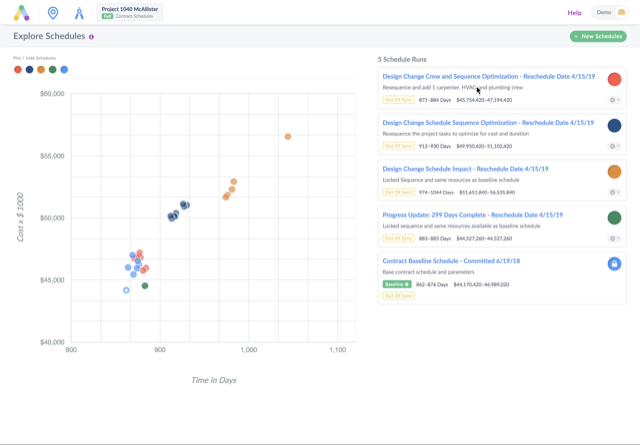 In addition to saving hours of a scheduler’s time, Alice can also significantly optimize a project’s overall timetable (they estimate up to 15%) and surface insights into better production sequences that may have not been apparent previously. Then, as a project progresses, the schedule can be updated within minutes to take change orders and delays into account. If a client needs to take 2 months off a schedule, parameters like number of cranes or crew size can be adjusted and an updated schedule and budget projection is quickly visible. Although its still very early days for AI scheduling applications like Alice, as more pilot projects validate the concept and provide positive results, we can expect to see much more use of digital planning assistants in complex construction projects in the coming years.